Don't even think about leaving Detroit without seeing the real Detroit. Join this locally-led Detroit tour to ride the city's 'People Mover' through baklava-laden Greektown, sculpture-dotted Civic Center, and hotdog heaven at Lafayette Coney Island. This is the D You Must See! Give Detroit the attention it deserves on this Detroit walking tour that shows you everything you absolutely need to see in this awesome American city. Meet your local guide at a cafe on Broadway and take a walk around the nearby area which includes spots such as Foxtown, Madison Avenue, and Paradise Valley. 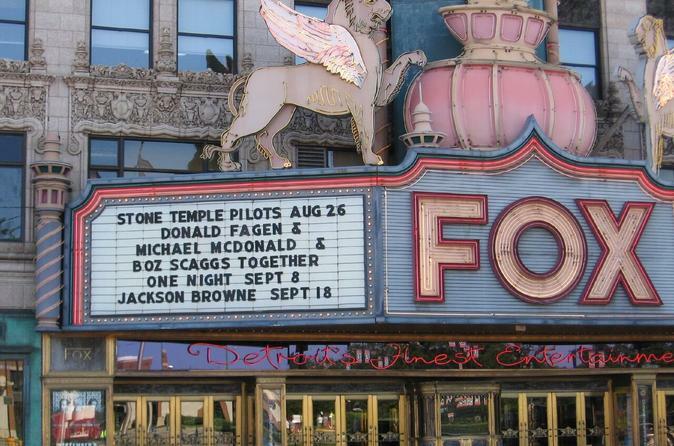 You'll see the fabulous Fox Theater, Comerica Park (which is home of the Detroit Tigers), the beautiful Detroit Opera House, and several other Detroit highlights - the perfect way to familiarize yourself with the city. Next on your Detroit city tour, take a quick ride over to the popular Greektown district on the elevated train called the 'People Mover.' In Greektown, you can taste a super-sweet piece of baklava, see a casino, or visit a historic church that was a stop on the Underground Railroad. Hopefully during your time in Greektown, you'll get to see a waiter light some liquor on fire over a piece of cheese, a classic Greek tradition. Opa! Another ride on the People Mover leads to a stop in the Civic Center area. Here you will see some famous Detroit sculptures and have a view of the massive Renaissance Center, home to the tallest hotel in the Western Hemisphere. You'll also be able to give our friends in Canada a wave from here! Next on this Detroit tour, you'll visit the 1929 art-deco Guardian Building to see the remarkably-beautiful lobby and banking room. It cannot be denied that this is one of the most beautiful buildings in Detroit and may even be one of the most gorgeous you see on your travels in the US. Walk by another landmark, the 47-story Penobscot Building, to American and Lafayette Coney Island restaurants, where you can try a free 'coney dog' - a grilled hot dog with Detroit-style chili, mustard, and onions. Detroiters have been devouring them for more than 90 years, so to get into the local spirit we suggest that you give it a go! Our last stop on this Detroit walking tour is seeing a famous renovated hotel which originally opened in 1924. We'll finish up with a ride on the People Mover back to Broadway.